Today in Masonic History Joseph Banks, 1st Baronet is born in 1743. 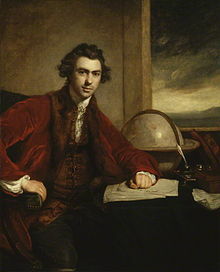 Joseph Banks, 1st Baronet was an English botanist and naturalist. Banks was born in London and grew up in Linconshire where his father was a wealthy country squire. Banks was educated at Harrow School and Eton College. He would attend Oxford and never receive a degree. Through out his young life Banks was interested in the natural world and botany especially, he would hire a botanist, with his own money, to give a series of lectures at Oxford the last year he attended. At the age of 23, Banks and a school friend traveled to Newfoundland and Labrador. The purpose of the journey was to learn as much as possible about the natural history of the area. He would make a name for himself by publishing the first Linnean, a rank based classification for organisms, descriptions of the plants and animals of Newfoundland and Labrador. From 1768 to 1771, Banks departed on a joint Royal Navy/Royal Society scientific expedition. The expedition, headed to the South Pacific, was James Cook's first expedition. The expedition took them to Brazil, New Zealand and to Australia where Cook made land at Botany Bay. There the expedition spent 7 weeks while the ship was repaired from damage it received on the Great Barrier Reef. During the 7 weeks in Australia, Banks and the other scientific members of the expedition, made the first major collection of Australian flora. Banks' team would describe, collect and illustrate more than 800 different species from Australia. When the expedition returned to England in 1771, Banks became instantly famous. He had intended on departing with Cook for his second expedition the following year. The Royal Navy withdrew their offer for Banks to go along when they became upset with Banks over scientific demands he was making for the vessel. Over the next decade, Banks would make local expeditions to Scotland, Iceland and other places collecting more botanical samples. In 1778 he was elected as President of the Royal Society, he would hold the position for 41 years. In 1779, Banks would give testimony in the House of Commons regarding the colonization of Australia. Banks would testify that there would be no better tract of land to receive convicts then Botany Bay. For the next 20 years Banks would be regarded as the general adviser for all matters regarding Australia. In 1781, Banks would be made a Baronet and would be an informal adviser to King George III regarding the Royal Botanic Gardens, Kew. In 1797, the position of adviser would become official. Banks would dispatch explorers all over the world to collect botanical samples. Through his efforts the Kew Gardens would become the per-eminent botanical garden of the time. Banks was a member of Inverness Lodge No. 4367. Records indicate that he joined the lodge sometime before setting out on the 1st Cook expedition.